BITS Integrated ME Admission 2016 (HD) – BITS, Pilani has released notification for admission to Integrated Higher Degree Programme at Hyderabad Campus for first semester 2016-17. Interested candidates can read the complete information of BITS Integrated ME Admission 2016 (HD) such as application form, eligibility criteria, application fee etc. on this page. Latest – The BITS Integrated ME 2016 Result has been announced. Scroll down to check Result. For admission to 3-year integrated Higher Degree programme leading to M.E., candidates have to appear in the Online tests conducted by BITS at designated centers in different cities and the admission is made on the basis of the performance in the online test subject to fulfilling the eligibility criteria. Candidates are advised to read carefully eligibility criteria and other relative details before submit the application form of BITS Integrated ME Admission 2016 (HD). BITS has announced the Result for the Online Tests held for the selection of the candidates for admission to Integrated ME courses offered at BITS, Pilani. The candidates who appeared for the online tests can check the BITS Integrated ME Result 2016 on the official website of BITS as well as here on this page by using the direct link provided below. Click here and enter the application no., gender & DoB. How to check the BITS 2016 Result online ? Visit the official link for BITS HD 2016 Result as provided above. Click Proceed button and Result will be displayed. Save and Print the Result for further admission process. Interested and eligible candidates should apply through the prescribed application form available online at www.bitsadmission.com and take the printout of the filled form. Candidates can also fill the online application form of BITS Integrated ME Admission 2016 (HD) through the direct link, which is given below. Note: A candidate can submit only one form for Higher Degree Admissions. However if a candidate discovers any mistake in the form submitted by him, he can submit a second application form duly completed before the last date, indicating on the top of second application form that his first application form (giving its number) should be cancelled. In such cases, the second application has to be accompanied by a fresh application fee. A minimum of 60% aggregate in the qualifying examination. Normal Input: Integrated Higher Degree Computer Science (with specialization in Information Security) – A 3 year B.Sc. degree or its equivalent (with Mathematics and Physics as subjects and at least one of these two as main subject(s)). Each candidate who registers for test will be required to download a ‘Hall Ticket’ from the official website as per the schedule. The direct link to download admit card is also posted on this page. 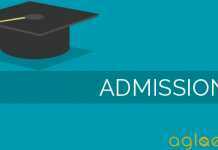 Get BITS Admit Card 2016 here:- Download Admit Card to appear in Examination. Candidates with the hall ticket only will be allowed inside the test centers. Blank sheets for rough work will be provided, if required. Candidates can bring a calculator without any network connectivity/programmable feature. For the above test all questions are of objective type (multiple choice questions); each question with four answers choices only one being the correct choice. Each correct answer in Mathematics and Physics sections fetches 3 marks, while each incorrect answer has a penalty of 1 mark. Each correct answer in English Language Skills section fetches 2 marks, while each incorrect answer has a penalty of 1 mark. No marks are awarded or deducted for questions not attempted. While the candidate can skip aquestion, the computer will not allow the candidate to choose more than one option as the correct answer. In order to facilitate a larger number of students all over India to participate in this test, apart from Pilani, Goa and Hyderabad where it is expected that a large number of students will take the test, the Institute is also planning to offer the tests at dedicated test centers in several cities. The planned test centers are in the following cities. The final list of centers and the operating days at each center will depend on the number of applicants and their preferences. The final list of the test centers will be announced only after all the applications are received and candidates will be informed of the same through BITS website www.bitsadmission.com. Candidates will be asked to give three preferences of center and will be allotted to one of the centers. The candidates will also be allotted test date and time. Admissions to the Program will be made purely on merit. Admissions to the Program would be based on the performance of the candidates in the computer based online test conducted by BITS The test will be a computer based online test conducted by BITS Pilani at dedicated centers at different cities of India. Computer based online test means the candidate sits in front of a computer and the questions are presented on the computer monitor and the candidate submits the answers though the use of keyboard & mouse. Each computer is connected to a server, which prepares the question set and delivers it to the candidate on the computer. The test is planned to be conducted during 28 May – 29 May 2016 and the candidate can choose the center to take the test as prescribed in later sections.